NAMM 2017: Having released scaled-down, module and iOS app editions, Korg is finally delivering the ARP Odyssey reboot that many people always wanted: a full-size version. That, of course, means full-size keys, as well as a more spacious control panel. Like its forebear, the ARP Odyssey FS is assembled in the USA, and will be available in limited numbers in Rev1, Rev2 and Rev3 editions. Interestingly, we're told that once each instrument has been assembled, it'll be 'aged', before being tested and released into the wild. In terms of sound and features, we're expecting the same deal as you get with Korg's standard Odyssey, but we're hoping to get our hands on these new models at the NAMM Show so that we can tell you how they look, feel and - most importantly - play. 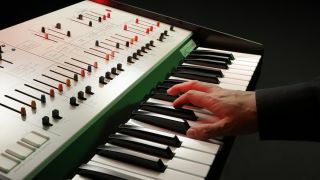 The price is expected to be around £1,299 for each model, and you can find out more on the Korg website.